Are you looking for an alternative ecommerce solution to BigCommerce? You may be on a search for a dedicated ecommerce platform, plugin, or an insights tool to leverage the processes of your ecommerce business. Fortunately, plenty of leading ecommerce software solutions are available to choose from that are equipped with a variety of features and functionalities. What are the top 10 alternatives to BigCommerce? Stepping up your e-commerce game is crucial, especially in this digital age. According to Statista, there are currently over 203.96 million shoppers in the US alone. The number increased significantly over the past few years and it will only continue to go up to 230 million by 2021. 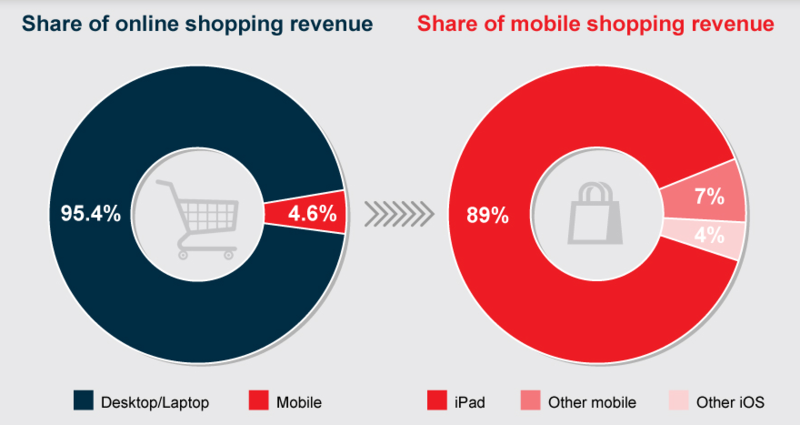 It is also worth noting that there’s a growing percentage of online shoppers who shop on their mobile devices. Consumers prefer the mobility and accessibility of purchasing from anywhere they are at any time according to another report by Statista. In fact, 80% of online shoppers use their mobile phone to look up products and place their orders. Now more than ever, it is vital for businesses to tap into the online market to expand your customer reach and grow your sales. A good place to start is by choosing an ecommerce platforms that simplifies the complex processes of building and managing your online store. To know this solution better, you may read what is ecommerce software and understand its features, benefits and pricing tiers. There’s no one-size-fits-all solution, hence, BigCommerce may not be the best choice for your specific business needs. Fortunately, there are plenty of options to choose from that are great BigCommerce alternatives. Before we’ll dive on the top 10 alternatives to BigCommerce, let’s get to know BigCommerce first to understand the similarities and how it compares to other products. BigCommerce is a robust shopping cart and ecommerce platform for businesses to set up and manage an online store. You can build your own design or choose among its wide selection of customizable templates for your online storefront creation. It also comes with built-in marketing tools to expand your client base and widen your reach. Furthermore, it incorporates shipping and delivery services for your physical products. Other main features include secure shopping cart, product catalog, social media marketing, reporting and analytics, and a mobile-optimized storefront. The vendor offers a great free trial that lets you try out all the key features first. 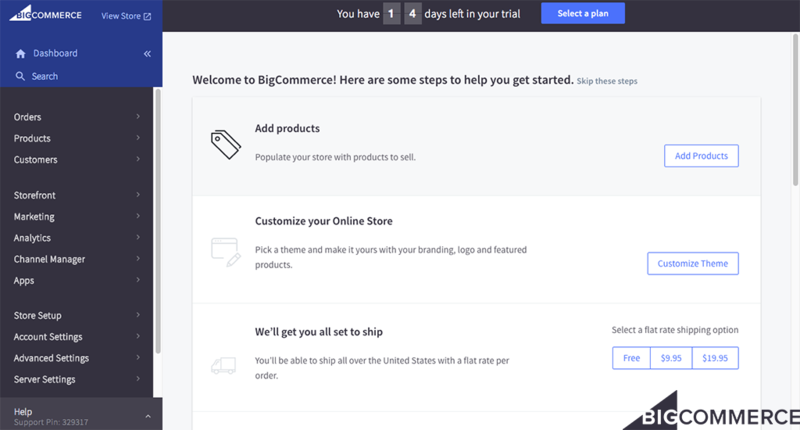 You can easily sign up for Bigcommerce free trial here. Open architecture. Equipped with one-click integrations, connecting the software with other systems is done with ease. It also has API and webhooks with unlimited API calls. Optimized shopping experience. It has customizable themes with drag-and-drop content blocks for featuring a specific product or blog content, among others. The local staging environment lets developers preview the changes made without having to update the live store when developing the website’s interface. Sales channel hub. It syncs orders, inventory, and product information across multiple channels. Partnerships with social platforms such as Facebook, Twitter, and Pinterest to enable customers to access “buy buttons” on these platforms. Built for medium to large businesses. Supporting multi-channel operations and high volume sales, the solution is suitable for medium to large businesses. It is an all-in-one solution to successfully run your business from order processing to shipping functionalities. Despite the functionality and features offered by BigCommerce, it may not be the solution you’re looking for. To explore more options, here are the top 10 BigCommerce alternatives. While these products have similarities with BigCommerce, they also offer features that are unique to each of their platforms. Wix is first on this list of top 10 alternatives to BigCommerce. It is a widely-known cloud-based website development platform used by individuals and small businesses. It comes as a free service but if you want to access its online store solution, you’ll have to choose its eCommerce premium plan or VIP premium plan. This lets you sell and manage your products online with a beautiful, customizable storefront. Its store manager lets you track your orders and manage your inventory efficiently. You can create collections to showcase your products individually or by category in product pages that you can design according to your branding. Additionally, it accepts multiple payment methods, sets customized tax rules, enables worldwide shipping regulations, and offers discounts, promos, and special deals. You can easily test out the software’s features and functionalities to help you determine if it meets your needs and choose a plan that matches your workflows. You may sign up for Wix free trial here to do so. Meanwhile, you may be interested in Wix alternatives to check out if it doesn’t suit your preferences. Why choose Wix instead of BigCommerce? It is geared towards SMBs in terms of pricing tiers and usability. It suits users with less technical knowledge as it’s intuitive and easy to use. It has a larger range of attractive templates. Why choose BigCommerce instead of Wix? It is a dedicated ecommerce platform built for medium to large companies. It allows more customization for users who are proficient with HTML. It connects quickly with platforms such as eBay and Etsy. Shopify is a popular ecommerce platform packed with all features and tools you need to build, operate and grow your online business. It doesn’t stop there as it also lets you sell products in-store. It specializes in providing tools for offline retail which makes it a good choice for sellers who are looking for accessibility and mobility in their system. With hosting provided by Shopify, you no longer have to worry about the technical aspect of running and maintaining your online storefront as the vendor handles it for you. It ensures the server is secure and regularly updated with the latest software version. Building your store is easy as it already provides you with professionally-designed themes and a responsive editor. This helps you set up your online storefront according to your branding with no coding required. It is best to try out the software first to know if matches your workflows. You may sign up for Shopify free trial here to test drive the software’s functionality and features. If you think it doesn’t suit your requirements, you may also look at Shopify alternatives for more options. Why choose Shopify instead of BigCommerce? It has a more affordable starting plan to access ecommerce features. It can be used by large enterprises as it’s scalable. It offers free SSL certificate. Why choose BigCommerce instead of Shopify? It has native language support to empower selling globally. It has a longer list of integrations with third-party applications. It has a high average uptime to ensure your store is never unavailable. 3dcart is an ecommerce platform for users to create and start running an online store with ease. This solution helps you leverage your operations with its rich set of features and partnerships with a wide range of business service providers. Some examples are payment processing services, tax calculators, and shipping carriers. The platform is highly scalable, feature-rich and intuitive. This makes it accessible for entrepreneurs—ranging from hobbyists, individuals, and SMB owners—who don’t have technical skills to set up their own online store. Additionally, it has a marketing approach with built-in tools for CRM, SEO, and promotions, and point-of-sale making it an end-to-end solution for your online storefront. To check if its features match your workflows, you may sign up for 3dcart free trial here. This will help you decide whether it suits your business. If you are interested to look at other options, here are 3dcart alternatives to look into. Why choose 3dcart instead of BigCommerce? It has REST API to tweak the software according to your needs. It has solutions for larger businesses. Its built-in marketing tools are robust for marketing initiatives. Why choose BigCommerce instead of 3dcart? It is available to devices in any operating system for PC and smartphones. It has responsive templates for customizing your website. It is built for fast-growing and high-volume businesses. Yotpo is a user-generated marketing platform designed for ecommerce and retail businesses. It is a plug-and-play social reviews app to generate reviews about products. It gathers crucial data to let you know which products are getting good reviews and which products aren’t. The solution makes it accessible and easy for your customers to leave comments and ratings as it has a smart mobile-first reviewing experience. The reviews also help in making your business more credible which is visible to certain locations where you get the most traffic. If you are interested in getting to know how the product works, you may sign up for Yotpo free demo here. This can help you see the benefits it can give to your business and determine if it matches your requirements. To look at similar choices, you may check out this article on the top 10 Yotpo alternatives. Why choose Yotpo instead of BigCommerce? It generates customer reviews on products to leverage your ecommerce business. It is a plug-and-play app that you can easily embed on multiple channels. It is a customizable and easy to use review app. Why choose BigCommerce instead of Yotpo? It is a dedicated ecommerce solution with website-building capabilities. It is suitable for medium to large enterprises with higher volumes of sales. It lets you create a fully-customizable site. Pinnacle Cart is a ecommerce solution that’s distinct from other products due to its additional offerings of customer support, digital marketing, and development, among others to drive traffic, sales, and conversions. Made for growing businesses, it is a full-service solution that immediately handles your sales as soon as you launch your store. It is a scalable and a smartly integrated system with enterprise-grade features to give you total control in running your business. Other features include SEO, product and category management, order management, content management, and reporting and business analytics. You may sign up for Pinnacle Cart free trial here so you can test drive its features. This helps you determine if it matches your requirements. For other options, here are Pinnacle Cart alternatives worth checking out. Why choose Pinnacle Cart instead of BigCommerce? It works seamlessly with its well-chosen third-party integrations. It has a tight data security feature with PA-DDS certification. It offers advanced shipping and payment methods. Why choose BigCommerce instead of Pinnacle Cart? It has no connectivity issues when integrating with third-party solutions. It offers flexible pricing options for different business sizes. It has a long list of integrations with external systems. SellerPrime, a behavioral ecommerce analytics software, is built for Amazon sellers to gain insights to use for leveraging their products, services, and processes. It aggregates digital data and takes advantage of it by extracting and measuring data at each funnel stage. You also get a complete picture of your customer’s behavior, trends, and patterns. Through driving real-time and highly relevant information, you can make data-driven decisions for your business. Its main features include product research, ideas, keywords, alerts and sources. It also has keyword research, listing quality, seller watch and PPC analyzer. If you want to get to know the product first, you may sign up for SellerPrime free trial here to try its features and functionality. You can use this opportunity to see how its tools can help your ecommerce business. Are you interested in other similar solutions? There are also plenty of SellerPrime alternatives to check out if it doesn’t suit your needs. Why choose SellerPrime instead of BigCommerce? It has a product intelligence tool that minimizes guesswork and business risks. It optimizes your portfolio with comprehensive dashboards to remove complicated spreadsheets from your workflow. It offers smart insights that are valuable for data-driven business decisions. Why choose BigCommerce instead of SellerPrime? It is an all-in-one solution for developing your website and transforming it into an online store. It has responsive templates to quickly set up your online storefront. It is highly customizable and easy to use. Jazva is a solution built for multi-channel ecommerce businesses. It caters to B2C and B2B companies as well as e-commerce merchants such as wholesalers and retailers who handle larger inventories, multiple warehouses, and higher volume of sales across their channels. It centralizes the processes in a single platform so you can handle numerous channels and tiers in a unified approach. The features that help deliver this solution are its various multi-tier and multi-channel tools and automation. It also has business intelligence, reporting, inventory management, and products and listings, among others. If you are interested to see similar options, here are Jazva alternatives to look at. Why use Jazva instead of BigCommerce? It has a multi-channel support for businesses with multiple channels and locations. It can support the needs of larger enterprises. It has business intelligence features to leverage ecommerce processes. Why use BigCommerce instead of Jazva? It gives you reliable hosting for your website. It offers solutions for fast-growing and high-volume businesses. It has an intuitive shopping cart solution. Volusion is a shopping cart software and ecommerce website solution built to drive business growth. Designed for small- and medium-sized businesses, it serves as a personal ecommerce assistant to build and manage stunning ecommerce websites with ease. Solo entrepreneurs and freelancers are also welcome to use the system. Its modules provide the app with its functionality for creating an online storefront, producing SEO-optimized content, and targeting the right market. Its main features include secure hosting, store builder, easy-to-use editor, social media sharing and integrations, and abandoned cart reports, among others. If you are looking for other features not offered by Volusion, you may look at these Volusion alternatives to see the offerings of other products. Why choose Volusion instead of BigCommerce? Its starting plan is more affordable with its monthly and annual payment options. It has self-generated in-house services and dedicated customer assistance. It has an open API platform for developers. Why choose BigCommerce instead of Volusion? It lets you choose your preferred provider to accept online payments. It has native language support and international payment providers to let you sell globally. It has no connectivity issues with its third-party integrations. Brightpearl is a omnichannel retail software built to streamline the tasks of retailers. It centralizes order management, inventory management, reporting, customer data and real-time accounting on a single platform. It prides itself on its high-performance ecommerce and marketplace connectors that can process over 25,000 orders every hour. It connects with leading solutions such as Shopify, Amazon, eBay, Magento, and BigCommerce seamlessly. It also has full-automation features for retailers to focus and allocate their time on managing their business instead of admin tasks. It also features customer buying behavior, cash flow, and profitability by SKU, among others. There are also Brightpearl alternatives worth checking out to explore more options in its category. Why choose Brightpearl instead of BigCommerce? It offers an omnichannel solution built for retail businesses. It has a real-time accounting with full multi-currency capability. It processes high volume orders per hour. Why choose BigCommerce instead of Brightpearl? It can support high-volume sales and orders. It has an intuitive, drag-and-drop website builder. It has native language support so streamline global selling. Laravel Ecommerce wraps the top 10 alternatives to BigCommerce. This open-source shopping cart system enables online businesses to build and personalize their website, effectively manage all facets of their operations on a single platform, and drive your sales while minimizing cart abandonment rate. Laravel Ecommerce allows you to manage multiple stores and every facet of their respective operations on a single platform, thus, it gives you total control of your business at all times without the headache of opening multiple solutions. Being an open-source platform, Laravel Ecommerce is fully customizable to suit a wide range of business verticals. It also comes with various eCommerce templates designed to provide shoppers a pleasant shopping experience and boost your conversions. This extends to the checkout process, as it allows you to customize the checkout process to ensure accessibility and enable customers to complete their transaction on a single page. If you are looking for other solutions aside from WooCommerce, there are Laravel Ecommerce alternatives with robust features and inclusions as well. Why choose Laravel Ecommerce instead of BigCommerce? It is fully customizable to suit various industries. It allows you to set a page checkout process to minimize cart abandonment rates. It features robust inventory management tools. Why choose BigCommerce instead of WooCommerce? It already includes hosting for your website. It supports high sales volume. It features a drag-and-drop website builder.